What you first need to know is that each of these sides of the diagram grows from the bottom, the least inclusive to the top that is the most inclusive. 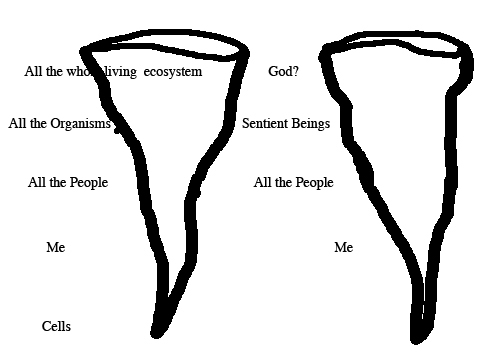 On the left is diagrammed levels of organization of life. On the right is my interpretation of what I have heard about lovingkindness meditation. Feedback on the latter would be especially welcome, because I know very little, but it seems to me progression of this wonderful style of meditation proceeds first with identifying one’s own compassion and then gradually expanding it to include all of the life of which one is a living part. It seems to me like — if science recognizes a reality that is taught in a 2500 year old spiritual tradition, there must be connections, right? Similarities? Maybe the conversion of two strong reality traditions toward the understanding of a common truth. Or one could say homing in from two directions on a common reality, and that would of course be the reality of life. Wouldn’t it?